For many years I have been making book cradles and supports for museums, archives and libraries to display valuable books and vulnerable bindings. These are usually made-to-measure from acid-free mount board, preventing stress being placed on the spine of the book and providing adequate support for the cover boards. Pages can be secured with clear polyester strips or, for very thin papers, with a soft polyethylene strip. 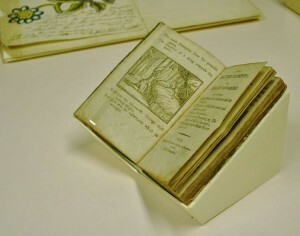 I am always interested to learn about, refine and develop new ways to present books and documents. 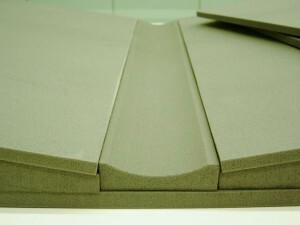 Many libraries and rare book collections make use of sets of foam blocks that are commercially available in a range of standard sizes. They are particularly good for protecting decorative bindings that have metal clasps and embossed details. The foam used for these blocks though is not considered archival or suitable for long term display as the foams are not UV-stable and will decay and crumble with long term exposure to light, emitting volatile degradation products. 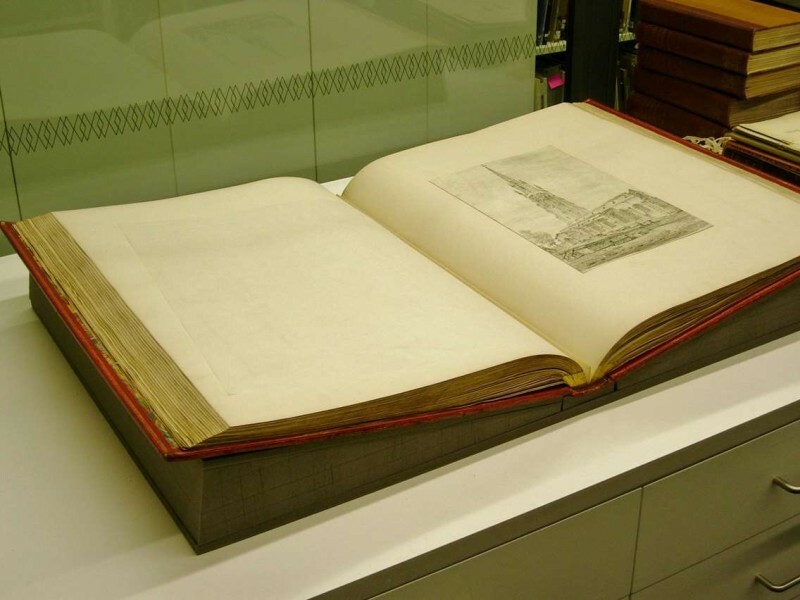 Whilst seeking a solution to display large albums from The Gott Collection belonging to The Hepworth Wakefield, I wanted a versatile foam support that was larger than the standard sizes and safe for longer-term exposure. Plastazote® is a closed-cell, polyethylene foam with excellent chemical resistance and good UV-stability, used extensively by museums for storage and display. 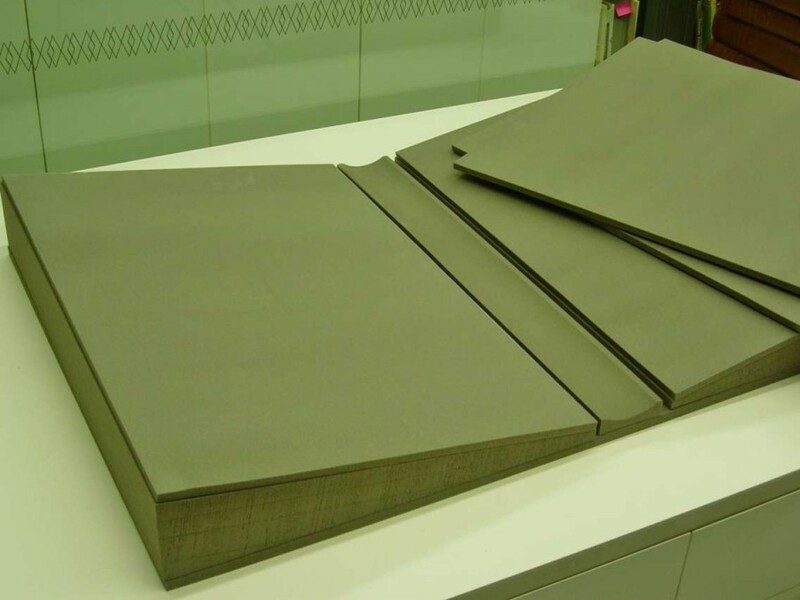 In conjunction with a company who fabricate and cut Plastazote® foam, I was able to design a set of foam supports tailored to the shape of large bound albums I wished to display. Three sets of supports were cut by the specialist fabricators based on drawings and measurements supplied by Artworks Conservation. Compared with other foam supports on the market, the cost was reasonable and they should have a considerably longer life span. 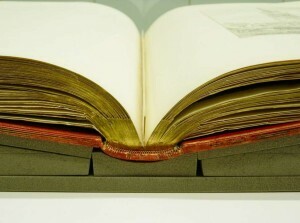 A curved strip supports the spine and foam wedges can be adjusted with additional sheets of Plastazote® foam so that the page opening position can be altered. These supports can be used in the gallery display case but also used for study and photography in the Archives Room. Strips and blocks can be cut to almost any shape to provide the perfect fit for your book. 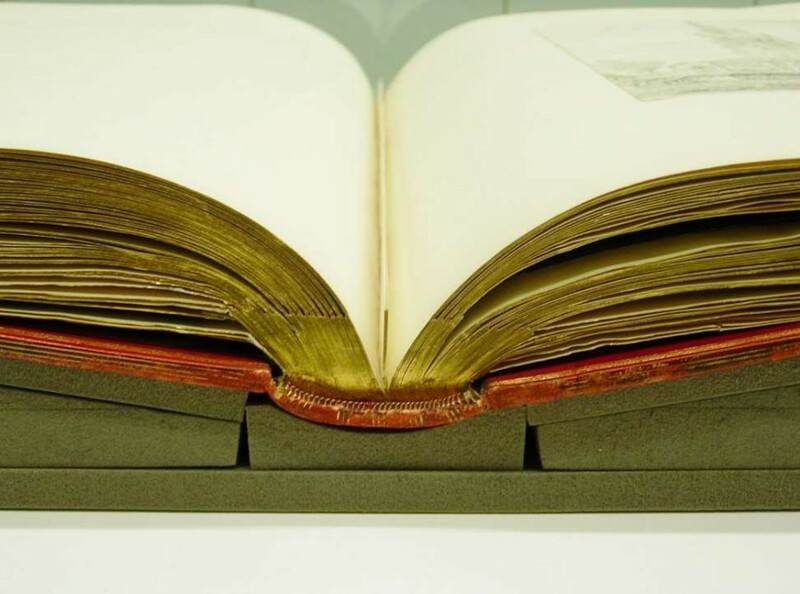 Their chemical and light stability, clean cut edges and range of colours available make these custom made, Plastazote® book supports an ideal conservation choice for displaying precious bound material. 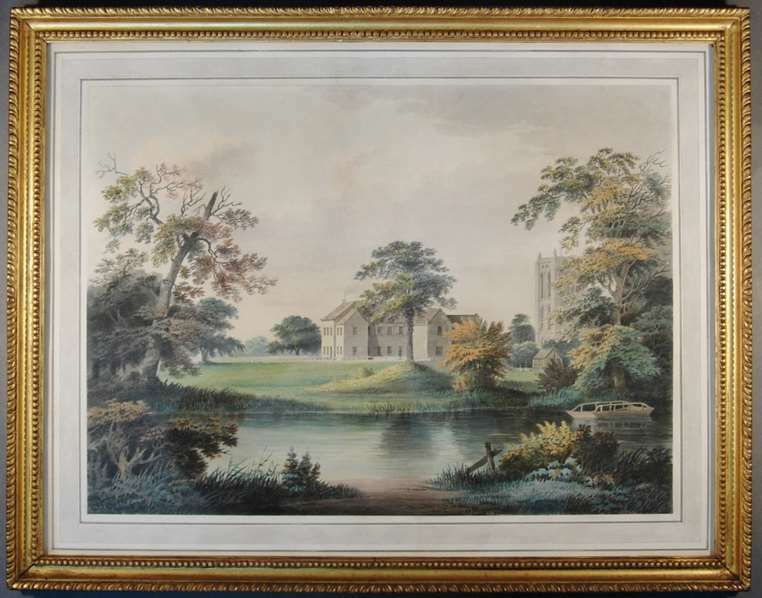 Please call Artworks Conservation on 01765 676600 or email info@artworksconservation.co.uk to obtain a quote for supplying either one-off or sets of these Plastazote® book supports.